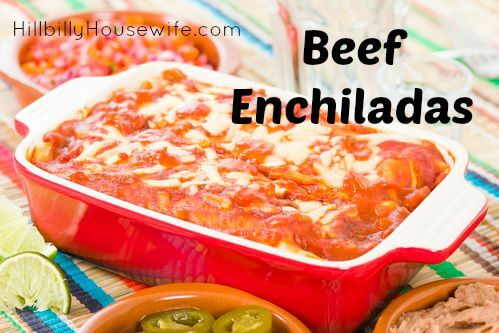 We love beef enchiladas around here. This is a great recipe that can easily be doubled. Use store-bought tortillas, or make a batch of these cornmeal tortillas. Get out a large skillet and start you hamburger to frying. Break it up into small pieces with a fork, and cook it until it is done. Drain off the fat if necessary. While the meat is cooking, get out a medium sized bowl, or a quart size measuring cup. Measure the warm tap water into it. Add the seasonings, stirring to combine. Add the tomato paste. Mix it really well until the tomato paste is dissolved. 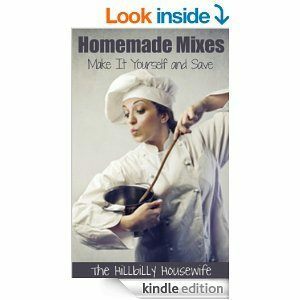 A wire whisk works admirably for this purpose, but a fork will do the job if you are diligent. This is the time to start warming up the tortillas. Some folks do this in the oven, wrapping the stack of them in tin foil and heating them at 400° for about 15 minutes. I do it on top of the stove though. Heat a clean, dry skillet over medium heat. Place a tortilla directly onto the skillet surface. When it becomes warm to the touch, (after just a few seconds), flip it and heat the other side. Continue until all of the tortillas are warm and pliable. Stack the warm tortillas on a plate. For the rest of the preparation, pour half of the seasoned tomato mixture into the skillet with the hamburger. Add half of the cheese too. Stir to mix up the meat, tomato sauce and cheese. Scoop a large spoonful of the mixture onto each tortilla. Roll up the tortilla, enclosing the filling, and place it seam side down in a large rectangular pan. Fill all of the tortillas the same way, placing them side by side in the pan. Pour the remaining tomato sauce over the prepared tortillas in the pan. Scatter the remaining cheese over top. Bake the Enchiladas at 350° for 30 minutes. This will serve about 5 people. It freezes well, and can also be stored in the fridge for a day or so, if you want to make it ahead of time. It is actually better if made ahead. If you are cooking it cold from the fridge, you may need to let it cook a little longer, maybe 40 minutes. And if it is frozen, cook it for an hour, covered with tin foil for the first 45 minutes.